Every Saturday, I host a feature called Kid Konnection -- a regular weekend feature about anything related to children's books. This week, I'm going to share with you my thoughts about the third installment of the Dork Diaries series. DORK DIARIES 3: TALES FROM A NOT-SO-TALENTED POP STAR by Rachel Renee Russell. She has been a big fan of this graphic novel series for a few years now and was very excited to learn that there was a new book. I have to say that I kind of agree with her. I, too, was anxious to see what Nikki would encounter in this latest book. DORK DIARIES 3 is very similar to the other two books in the series, and I think fans of the series will be pleased with this latest installment. DORK DIARIES 3 has the same adorable artwork along with the humor and life lessons that I've come to expect from these books. In DORK DIARIES 3, Nikki is still living her "secret life" as a scholarship student at an expensive private school. When her parents receive a bill for her tuition, she enters the school talent show in hopes of winning the grand prize of a scholarship. Along the way, she encounters "mean girl" trouble with her arch-enemy MacKenzie as well as plenty of embarrassing moments at home and school! 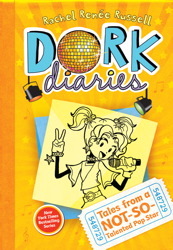 For those of you not familiar with the Dork Diaries series, the book is kind of a DIARY OF A WIMPY KID for middle-grade girls. The book is written in the format of Nikki's journal -- it even looks like a lined notebook with her handwriting. And it also includes loads of precious illustrations. Because there is a good mix of text and graphics, even reluctant readers will be able to fly through this book! Booking Daughter read this book just moments after it arrived on the doorstep, and I wasn't too far behind. We both agreed that the book was very fun and entertaining; however, I have to wonder if my daughter isn't starting to outgrow these books. The book is geared for girls in grades 4 through 8; and while she's only entering 7th grade, I do think she appreciated these books more a few years ago. Either that, or the premise of the books isn't as original as it used to be. I admit that I was pretty entertained by DORK DIARIES 3. It was a quick, cute read that made me laugh on quite a few occasions. I'm not sure that I loved it as much as the first book in the series, but I still wouldn't hesitate to read everything this author writes! As a mother, I appreciated some of the messages in this book about family, friends, and crushes; and I do like how Nikki seems to be a realistic tween. I am pretty sure that young girls will relate to Nikki's feelings of insecurity especially when it comes to her embarrassing family and the "queen bee" at school. Both Booking Daughter and I are big fans of DORK DIARIES and we will continue to look forward to future books in this series. If you have a tween girl in your life, she's probably already familiar with these books. But just in case she's not, I highly recommend them! I haven't actually read any of the Dork Diaries yet but I love this new publishing trend of using different fonts and illustrations to make portions of books look like they were handwritten! My book today, Ghetto Cowboy, is a wonderful inspirational middle grade read. Great choice, Booking Daughter! I read one of the Dork Diaries books and just loved it! I've read parts of Dork Diaries to The girl, and we both giggled. Nice! I haven't read these, nor have I read Wimpy Kid but I've heard such good things about both. My daughter loves the Dork Diaries! She thinks they are fun and cute, perfect for the tween years. The Girl loves this series! She's started this one but is finishing up another book first. My daughter has just never gotten into the Dork Diaries. Sounds like a fun series, though.